Children of all ages love to paint, and as kids get older their artistic skills develop at a rapid pace. Learning how to paint something more advanced than single-dimensional pictures is one skill all children should learn. Painting a night sky picture is one way for kids to discover how to appreciate the wonder of the sky at night, and see the light show that nature stages for us every evening. Along with other simple painting ideas, this project will both teach them about the world around them, as well as help develop their own innate creative and artistic talents. This is a late-night activity, so younger kids may need an afternoon nap beforehand. But for many small children, the excitement of staying up past their bedtime is almost insurmountable. Being awake when it's dark outside is unimaginably exciting for most children, as is knowing they are up while younger siblings are asleep. If you don't want your young children to stay up too late, start looking at the sky around sunset, watching how the colours majestically change when the sun does down. Staying up past sunset, however, has numerous benefits: not only will your children be able to appreciate the wonder of the stars, but it will also help acclimatise those who are scared of the dark. Start by watching how the colours change, then look at the sky full of stars. If your child shows signs of becoming a budding artist, you may want to show him or her pictures of the night sky as painted by famous people beforehand. Van Gogh, Miro, Munch and Matisse all have famous night sky paintings which you can easily find reproductions of on the Internet or at the library. Photographs of the sky at night are also a good way to pique a child's interest before seeing it for him or herself. Once they are primed to embrace the evening, let them go wild with the paints. Tell them that it's not only about bright dots on a dark background but about colour changes, palette changes and streaks of light. Let them use their imagination: if they want to add aliens or the Man in the Moon to their picture, go right ahead! Talk to your kids about stars, constellations, the moon and the planets. You may want to read them a story such as Good Night, Moon before taking them outside, or purchase glow-in-the-dark stars for their bedroom to explain more in detail about constellations. Even very young children will enjoy a visit to the local planetarium, and an outing such as this may also be a good idea to get your kid's creative juices flowing before getting out the paints. Your project may turn out to be not only an introduction to painting, but an intro to basic astronomy as well! Leaf Paintings: Collect lots of dry leaves, paint a tree trunk and glue the leaves on. Adding acorns, pine cones etc will make the painting even more realistic. Blow Paintings: Take a drinking straw, put a blob of paint on paper and blow it around. Try with different colours to make loads of pretty designs. Best done outside in nice weather! Fruit and Veg Prints: Cut pieces of fruit and veg in half, make sure they're dry and dip in paint. Press onto paper and hey presto, beautiful stencil art. Apples, potatoes, firm mushrooms, grapes and other hard, dry fruit and veg work best. String Paintings: Lay a large piece of paper on the ground, then dip a piece of string in paint. Whisk the string on the paper and move it around to create desired effect. Can use several different colours mixed to create a rainbow pattern. Glue on leaves, sticks, twigs and other natural items to create a brightly coloured picture. Paper Plate Flowers: Buy cheap paper plates and encourage your children to paint the entire surface a bright colour. Cut out leaves and stems from construction paper and glue on. You can add texture to the middle by gluing sunflower seeds, rose petals, leaves and other items from the garden. Painting outside can be loads of fun in summer, and hopefully these ideas will provide you with inspiration to continue such activities for years to come. 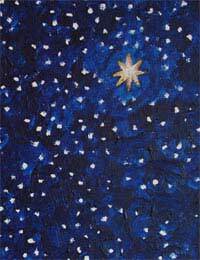 Painting the night sky is just one activity your children are sure to love, and you might enjoy it as well!